Daniel Blackford has engaged in health and strength-building activities for more than 17 years. He is a longtime member of an adaptive ski and sports program in Vermont; trained for the Special Olympics held at Bridgewater High School; and participates in hippotherapy using a horse to improve weight bearing. Daniel’s weekly music therapy sessions allow him to participate as a choir member by using a hand switch to elicit sound through a music synthesizer. 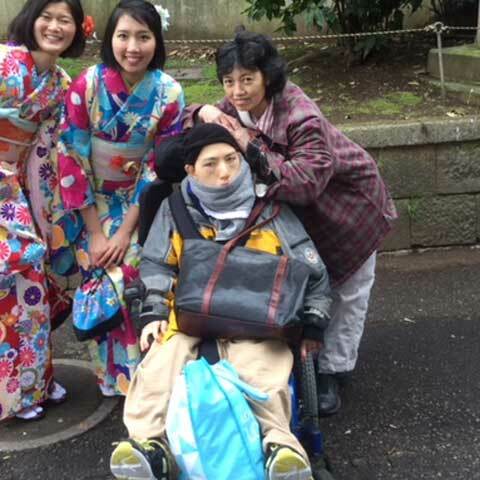 He and his mother Carmelita have travelled to Tokyo, Hong Kong and Argentina. “One of Daniel’s favorite Broadway shows is Evita, so we went to Buenos Aires to track down Eva Perón’s roots,” said Carmelita.